In the south of Ardeche. Welcome to South Ardèche at CAMPING LES ACTINIDIAS! Cécile and Claude Mesclon cultivated tomatoes, strawberries, peaches, courgettes and other fruits and vegetables when the camping pioneers of Actinidias arrived in 1977. They welcomed them in the middle of the field which became Actinidias campsite - the name of the liana tree planted by Claude, which produced exotic kiwis. Isabelle, the daughter of Claude and Cécile, and Christophe naturally, took the reins of the camp-site when Claude retired. Today Boris, Claude's grandson, continues the family tradition and welcomes you with Julie, his partner. The whole family work together to offer you a family vacation, relaxing or sporting in Actinidias. We offer you shaded pitches for caravans, tents and motorhomes and also some Chalets and Mobile homes. One of these has disabled access. The campsite has 2 sanitary blocks, 19 rentals and 81 pitches. 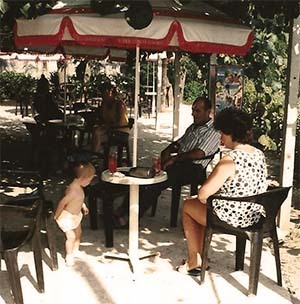 This is a FAMILY CAMPSITE on the heart of the Cevennes d’Ardeche. You can by basic products in our small on-site shop and order fresh bread and pastries. In July and August the campsite snack bar is open for pizzas, burgers, Ardeche salads and other snacks. The campsite is located in a quiet and protected area. Just nearby the Bois de Paiolive offer you beautiful labyrinths and animals modeled in the rocks. The river CHASSEZAC flows nearby which offers you a large natural swimming pool between cliffs and rocks. Perfect for swimming, fishing or canoeing. Close to the campsite are more than 500 climbing routes and a lot of hiking routes. This is a paradise for nature lovers and sports lovers. Close to the campsite you can visit some typicals villages, secret swimming areas, and many easy walking routes to discover our beautiful landscape. Pay your deposit online booking directly with our partner Crédit Agricole.